Brussel sprouts! They used to be the vegetable I avoided until a friend of mine made me try them years ago. I always thought they would taste like cabbage, which I’m not a fan of, but they were surprisingly different and only resemble cabbage in appearance. Brussel sprouts are nutty, buttery, nutritious and so filling. They are the perfect accompaniment to grilled meats and seafood but can also be enjoyed alone. They are also one of the healthiest of vegetables, packed with all sorts of nutrients. Brussel sprouts are high in protein and fiber, low in calories and loaded with anti-oxidants to help protect against heart disease and cancers. Also, according to doctors and nutritionist, adding a little extra kick from spices will also help rev up your metabolism. Sometimes I will have these after getting home late from a good work out at the gym. They are light, and quick and easy to make. They are so tasty there is really no reason not to add them to your diet. 1. Rinse the brussel sprouts in water and peel off a layer or two and cut each in half. Heat up a cast iron skillet or heavy bottom pan on medium heat and add butter. As butter is melting toss in brussel sprouts and stir. 2. Add the garlic, pepper flakes and the salt and pepper to taste. 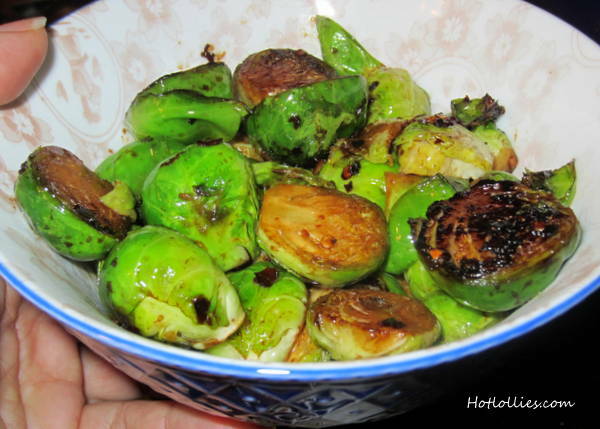 Stir and cook for about 8 minutes until the brussel sprouts are tender and nicely browned. Enjoy in a bowl with a glass of white wine!